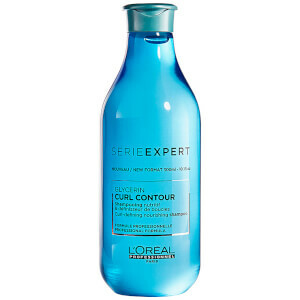 Nourish and enhance curly and wavy locks with the L'Oréal Professionnel Serie Expert Curl Contour Shampoo and Masque Duo; a pair of complementary hair-care treatments that work in tandem to cleanse, hydrate and nourish for defined curls with undeniable bounce, body and va-va-voom. A lightweight formula that works to enhance curl shape and definition. Infused with Glycerin, the luxurious shampoo effectively cleanses hair, whilst delivering long-lasting moisture and hydration for salon-worthy results. Curls are left calm, fresh and bouncy. Can also be used on straight hair to prepare for curling. A curl-defining and super-nourishing hair mask. Infused with Glycerin for its hydrating properties, the gel hair mask restores moisture to curls, resulting in a softer, smoother hair surface and a more defined shape. Locks are left visibly boosted with a healthy shine. Shampoo: molhe o cabelo e distribua o shampoo uniformemente. Massaje para fazer espuma. Enxague abundantemente. Máscara: aplique uniformemente no cabelo lavado com shampoo e enxuto com toalha. Deixe atuar durante 3 a 5 minutos. Passe bem por água. Em caso de contacto com os olhos, lave-os imediatamente. Shampoo: Aqua/Water, Sodium Laureth Sulfate, Coco-Betaine, Glycerin, Sodium Chloride, Laureth-5 Carboxylic Acid, Isostearyl Neopentanoate, Cocamide Mipa, Polyquaternium-L0, Ppg-5-Ceteth-20, Amodimethicone, Sodium Benzoate, Peg-55 Propylene Glycol Oleate, Propylene Glycol, Peg-60 Hydrogenated Castor Oil, Salicylic Acid, Hexyl Cinnamal, Linalool, Butylphenyl Methylpropional, Hydroxycitronellal, Geraniol, 2-0leamido-1,3-0ctadecanediol, Vitis Vinifera Seed Oil / Grape Seed Oil, Methyl Cocoate, Benzyl Alcohol, Sodium Cocoate, Sodium Hydroxide, Citric Acid, Parfum / Fragrance. C43350/1. Masque: Please refer to packaging for full list of ingredients.